Use only one hand to measure your patient! Using your finger, move the measurement head through flexion, extension and hyper-extension. Measures 110° flexion through 40° hyper-extension in 5° increments. Arm has 10cm/4″ scale. 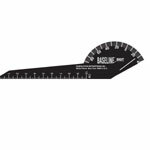 This goniometer is also known as a one-hand goniometer because readings can be taken by the therapist using only one hand. This frees up the therapist’s other hand to stabilize the patient during measurement or to record the measurement.